After a trial run of the Walk/Jog rule as previously stated in the UKPHA 2019 Performance Rules at the Oakridge Easter show and the feedback from the members who were there, UKPHA committee have amended the rule at this time, to exclude all classes from the rule except for paint classes, i.e. APHA & UKPHA . "Entering any APHA or UKPHA Open or Amateur (including Novice Amateur where available) categories will exclude that exhibitor from entering UKPHA Walk / Jog classes for the duration of that show on the same horse. In other words, if you enter a UKPHA walk/jog class you cannot enter any APHA / UKPHA classes outside of walk/jog for that show." As you can understand this rule is not to discourage exhibitors from entering APHA Amateur or Open classes (i.e. loping classes) but is designed to make the UKPHA walk/jog classes as level a playing field as possible. Walk/Jog is becoming a serious category in its own right within APHA and UKPHA would like to support and encourage people who for whatever reason are not comfortable loping, to enter the ring and have fun and challenge themselves. Thank you to everyone who contributed to this decision and with the members help, UKPHA committee will continue to drive UKPHA forward. 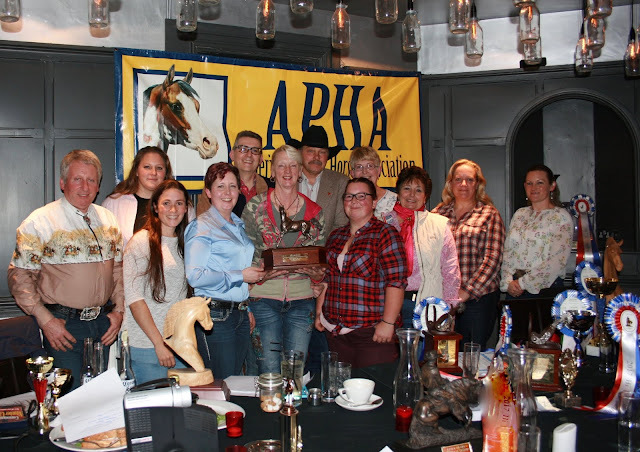 UKPHA, as a regional club of the American Paint Horse Association, follows the APHA rules for our unaffiliated UKPHA classes, as published by APHA each year, with the following exceptions:- Click here for the document. Check out our website event page for more details of the 3 day event and our Judge ! Plus news of our 2018 Gathering in September is on our Event Calendar page ! These Rule Book Change Proposals were voted on and passed by the 2017 Board of Directors at the 2018 APHA Annual Convention held in Irving, Texas, March 2nd through March 5th, 2018. The rules become effective on January 1, 2019 unless early implementation was requested. All text in bold letters indicates the change to the rule. If the entire rule is in bold letters the rule is considered an entirely new rule. The 2018 APHA rule book is now available from the home page of our website. After 16 years the current President, Sue Painter and Secretary, Rob Painter (both Directors) have stood down from their roles the board having identified knowledgeable and enthusiastic successors to take the Club forward. We are please to announce the AGM approved the appointment of Helena Ryan as President and Martin Collins as Secretary. To assure a smooth transition to the new leadership team the AGM also approved that Rob Painter remain for a year as Treasurer. recommended the Sue Painter be retained on the Board for a year in a new role of Breed & Genetics Officer. This role would support the board and its members in staying current with the various changes in genetic standards, leveraging both Sue's Knowledge and Passion for the Breed. This was proposed to the AGM and all roles were passed unanimously. Helena Ryan, incoming President said she was delighted Sue would stay on in the new role and that “it had help lift a weight off her shoulders”. Sue & Rob were also recognised for they work over the past 16 years with a surprise presentation of a beautiful trophy and a bouquet of flowers, arranged by other board members and contributed to by several current members. As a further surprise the Executive President of APHA also sent his best wishes via a pre-recoded video. It was Rob & Sue’s plan and intension to fully step down as board members but they are both happy to stay involved in lesser capacities to support the transition to a new and vibrant team. The 2017 Year-end awards were presented following the AGM held on the 11th November. For those members who have competed in the 2017 season can you please complete and send in your High Points forms to Melanie Scott by the 30th October. This ensures we have time to work out the winners and have the trophies etc ready for our AGM & Year-end Awards to be held on the 11th November. A PDF form - for those who prefer to hand write their returns. If you have any questions about the forms please contact Melanie via email. Huge thanks to Oakridge Arena and Sherwood Circuit for including UK PHA & APHA classes in the Halloween show. Your support is greatly appreciated. Now memberswe need you to come and support the show. Points from this event will count to the year end awards and will be your last chance to rise up the leader board.